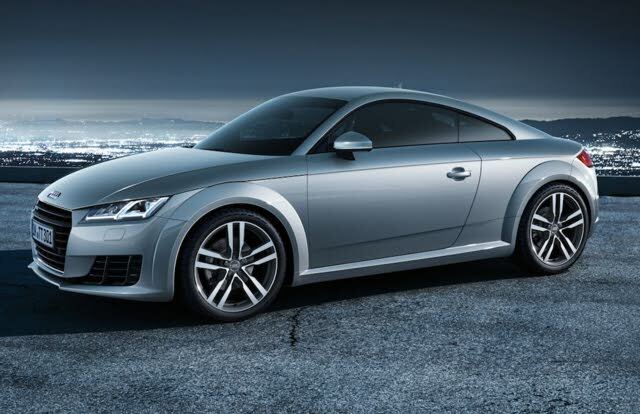 Looking for a New Audi TT in your area? CarGurus has 308 nationwide Audi TT dealers with 396 new car listings. In celebration of the Audi TT’s 20th anniversary, Audi makes some changes to the third generation of this sports car, which was last redesigned in 2016. The refreshed TT, which is still available as a coupe and a soft-top convertible, now features more athletic styling, updated powertrain technology, and new standard equipment. It competes with other German coupes like the BMW 2 Series. The Audi TT didn’t need much improvement in terms of exterior styling, and Audi was wise to make only the most simple of changes. Aside from dramatic new air inlets under the front lighting, the changes are rather subtle. For a more dramatic update, check out the S line exterior package, which includes exclusive side sills, a titanium-black front grille, a front splitter, a rear diffuser, and vertical front and rear air inlets. Cosmos Blue and Pulse Orange get added to the main color palette, while Turbo Blue is exclusive to the S line. The TT’s three engine options, which correspond to trim levels, carry over. The TT features a turbocharged 2.0-liter 4-cylinder engine rated for 220 horsepower and 258 pound-feet of torque. Transmission choices, which vary by trim, include a 6-speed manual and a new 7-speed dual-clutch automatic. All-wheel drive (AWD) is standard. Fuel economy ratings are not yet available for 2019. Audi TT coupe models seat four passengers, though the rear seats will be a tight fit for adults, and roadster convertible models accommodate two. The aircraft-inspired cockpit plays well with the sporty, upscale seating. The base TT comes well-equipped with leather upholstery and a proximity key. The Audi Virtual Cockpit, a customizable 12.3-inch digital display, is the visual focus of every TT. Other standard features include a 9-speaker audio system, satellite radio, and Audi’s MMI infotainment system with handwriting recognition and voice recognition. Options include a Bang & Olufsen 14-speaker audio system, Apple CarPlay and Android Auto, and navigation. The Audi TT has not been tested by the National Highway Traffic Safety Administration (NHTSA) or Insurance Institute for Highway Safety (IIHS). That is par for the course for a luxury sports car. A reversing camera and front and rear parking sensors come standard. Options include blind-spot monitoring, lane-departure warning, lane-change assist, and traffic-sign recognition. When the refreshed 2019 Audi TT arrives in the United States, all but the most dedicated Audi fans will have a hard time spotting the changes. This generation continues with sleek styling inside and out. What's your take on the 2019 Audi TT? Have you driven a 2019 Audi TT? Enter your zip to see incentives for a new TT in your area. Looking for a Used TT in your area? CarGurus has 710 nationwide TT listings starting at $2,800.